Asides from being a professional football player, Jonathan Stewart has another area of interest and that is music. The New York Giants’ running back is an aspiring music producer and if you are imagining that he is desiring to go into the music industry for the money, you are so so wrong because the player has made it clear that music for him is as much a passion as the football is. Stewart like many other players developed the love for football in high school where he played with the school football team. After high school, he went ahead to play college football at Oregon before the Carolina Panthers selected him 13th overall in the 1st round of the 2008 NFL Draft. Born as Jonathan Creon Stewart on the 21st of March 1987, in Fort Lewis, Washington, Stewart attended Timberline High School, Lacey, Washington, where he held the records as the leading rusher in the school’s football history. As a freshman, he rushed 1,279 yards on 95 carries, that is 13.5 on average and recorded fifteen touchdowns. In his sophomore, he rushed 1,609 yards on 153 carries with fourteen touchdowns despite missing almost half of the season due to an ankle injury. In 2003, he rushed 2,566 yards on 285 carries with forty-five touchdowns as a junior and in his senior season, he rushed for 2,301 yards, with an average of 11.2 yards per carry and recorded thirty-two touchdowns. Stewart was named to the Parade High School All-American team and the USA Today All-USA team that season and he also won the Washington Gatorade Player of the Year Award. He received offers from several schools like Ohio State, USC, California, Nebraska, Notre Dame, and lots more but chose to play for Oregon. 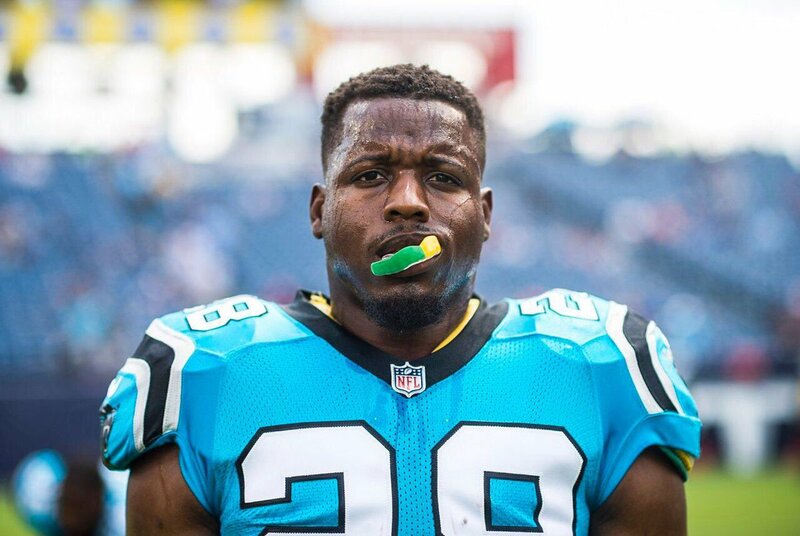 Despite missing two games in his first season due to an ankle injury, he sustained during a game against Montana, Jonathan Stewart still ended the season with a total of 9 touchdowns which included 6 rushes, one receiving and 2 kickoff returns. His Sophomore season ended with ten rushing touchdowns and one receiving. As a junior, he recorded a career-high of 32 carries for 251 yards with 2 touchdowns and would later be named the 2nd highest single-game total in the history of Oregon football. Jonathan set a Sun Bowl record for rushing yards to win the C.M. Hendricks Most Valuable Player award. At the end of the season, he recorded 1,722 rushing yards, 11 rushing touchdowns, 22 receptions, 2 receiving touchdowns and 145 receiving yards. He has also selected the All-Pacific 10 Conference first team by NFL coaches and also garnered the All-America notice. After his junior season, Stewart announced he was forgoing his senior season to enter for the 2008 NFL Draft and was projected to be among the top 3 running backs entering the Draft. He was selected by the Carolina Panthers as the 13th overall pick in the 1st round of the 2008 NFL Draft. His first contract with the franchise was worth $14 million with a maximum value of $20 million and $10.795 million guaranteed. Stewart would end his rookie season, breaking a Panthers rookie record of 10 rushing touchdowns, 836 rushing yards on 184 carries with a 4.5 rushing average. During the 2009 season, he earned FedEx Ground Player of the week honors after recording 206 rushing yards in their final game against the New York Giants which ended in a 41-9 win. 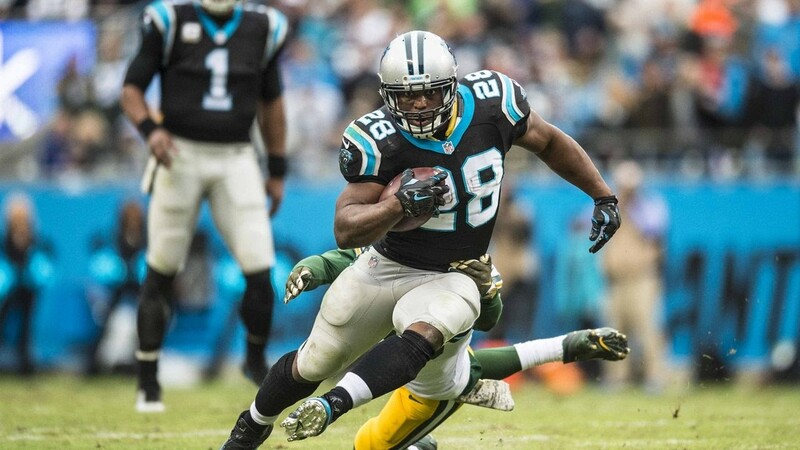 Jonathan Stewart would sign another five-year contract extention with the Panthers in 2012. The deal was worth $37.811 million, with $23 million guaranteed and was valid until March 2017 when he signed a one-year contract extension. In week 14 of that season, he ran for 103 yards and 3 touchdowns, which included a sixty-yard run that earned him the NFC Offensive Player of the Week. He ended the 2017 season with 680 rushing yards and 6 rushing touchdowns. After ten seasons with the Panthers, the franchise finally released him in February 2018 and the following month (March), he signed a 2-year with the New York Giants, worth $6.9 million. The multiple award-winning running back stands at the height of 5 ft 10 in (1.78 m), weighing (240 lbs). His other body measurements are not known. He is married to Natalie Hills and the couple welcomed their first together, a baby girl, named Kaia Grey, which was born on the 9th of March 2017.